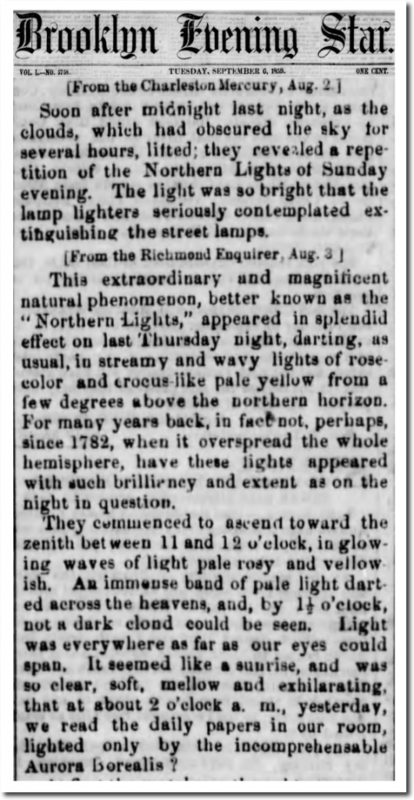 A giant coronal mass ejection occurred during August 1859. When the solar wind arrived at Earth, it brought auroras as far south as Panama, and disrupted all electronic communications. Strong currents ran through electrical wires which had no batteries attached. The light was bright enough for people to read at night. After similar storms in 1789 and 1848, people noticed extreme weather events. Light was everywhere as far as our eyes could span. It seemed like a sunrise, and was so clear, soft, mellow and exhilarating, that at about 2 o’clock AM yesterday, we read the daily papers in our room. Modern climate experts believe solar activity does not influence the weather, and that the climate is controlled by a 0.0001 mole fraction increase in a harmless trace gas. Reading at 2 AM during a CME is something that I could and did not conceive as probable or possible. Now I understand the pure spike power of the sun and the implications if a Carrington event should occur now. We have spent hundreds of billions for “renewable” energy due to CO2 while it should have been spent to harden our electrical grid and electronics. Buy food and such and store. During the antarctic winter penguins don’t live in the dark. And those on land or sea ice enjoy the albedo of the white stuff surrounding them. Of course you can also look for a place where people live with artificial sunlight. A Carrington Event in 2018 would be devastating! Would probably cost several trillion in damages and cause mass social unrest. North Korea would hardly notice. So much fun when the nuclear power plants run out of diesel. It was a sight that likely had people standing in the streets of Charlottesville and staring at the heavens with mouths agape. 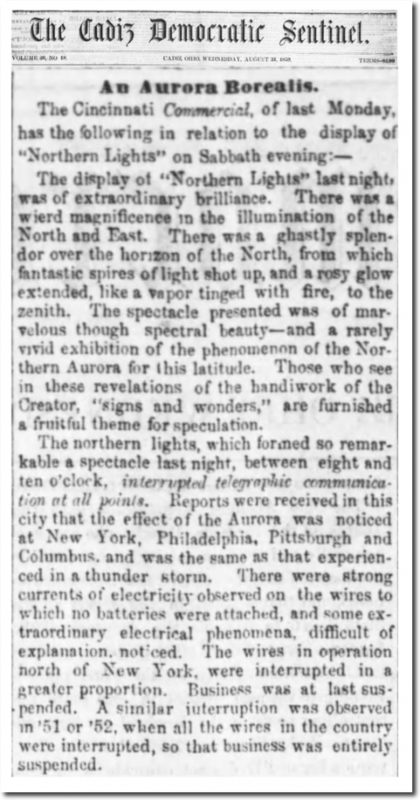 What they would have witnessed on the frigid night of Dec. 14, 1862, was one of the most dramatic presentations of the Northern Lights ever seen in recorded history. Eyewitness accounts tell of shafts of multicolored rays dancing and swirling across the sky. Some of the best descriptions of the celestial event came from Civil War soldiers who were immersed in the Battle of Fredericksburg, being waged 66 miles to the north of Charlottesville. It was a particularly unnerving sight for the combat-weary men, many of whom had no idea what the phenomenon was. One account said that the sky, “turned as red as blood.” Another warrior diarist wrote that a Florida outfit that had stood firm under fire on the battlefield ran off in a panic when the “remarkable brilliancy” first appeared. The display started a little after 6 p.m., when the clear, black sky suddenly started to brighten along the northern horizon. This dawn-like apparition would have been enough to shake the stoutest constitution, but it was only the preamble. The light increased in radiance and climbed higher into the sky. Then, as the light cast a disquieting glow on the ghastly battlefield strewn with dead, the heavens erupted with spinning colors. It was as if gigantic Roman candles were firing spears of various colors into the firmament. Red, whites and blues caused some of the Federal troops to interpret the event as a favorable omen. I would imagine one could say goodbye not only to GPS and satellite and cell tower com for a considerable time and also to the ISS and those in it in the event of such thing happening now days. Our interconnected digital world would be in a more disconnected state than it was in the 50’s and Tony wouldn’t even be able to post about it for a long time afterwards. Astronomers wouldn’t even be able to use their digital reliant instruments to see if there was more coming and their satellites like SOHO would be fried even if they could possibly communicate with them. The world that would emerge from such an event would a different one than it was before for nearly everyone. Thanks, good read. For it to be seen that far south is pretty impressive. Of course less light pollution in those days but even so…..